A plant meat and a traditional meat company have announced an investment agreement whereby Springdale, Arkansas-based Tyson Foods Inc. will own a five percent stake in Beyond Meat. The undisclosed dollar value was raised through an initiative of El Segundo, California-based Beyond Meat, which brands itself as “The Future of Protein.” Other investors in the company include The Humane Society of the United States, Microsoft founder Bill Gates, and venture capital company Kleiner Perkins. Brown says he is aiming for transformative change, beyond the “believers (like me)” and into the broader market. The global plant-based meat industry is expected to grow at a rate of 8.4 percent, according to Allied Market Research, with an estimated worth of $5.2 billion by 2020. The meat industry, by comparison, is almost 36 times larger in the United States alone, according to the North American Meat Institute. Tyson is the world’s largest processor and marketer of chicken, beef, and pork. Nothing specific is being said about cooperation between the two companies, but both are saying the deal gives each a way to better serve the changing consumer. “I don’t expect to change Tyson. Nor does Tyson expect to change me,” wrote Brown. Tyson, for its part, spoke of the investment as a way to get exposure to a fast-growing segment of the protein market. “It meets our desire to offer consumers choices and to consider how we can serve an ever-growing and diverse global population, while remaining focused on our core prepared foods and animal protein businesses,” said Tyson Executive Vice President of Strategy & New Ventures Monica McGurk, in a press release. Brown could not have secured a bigger partner to potentially help him to mainstream his meat alternatives, and it is just one of a set of deliberate steps in this direction. Tyson supplies fast food giants McDonald’s, Burger King, Wendy’s, and mega retailer Wal-Mart. Tyson’s brands—which include Jimmy Dean, Hillshire Farm, and Sara Lee—touch two out of five American dinner plates. 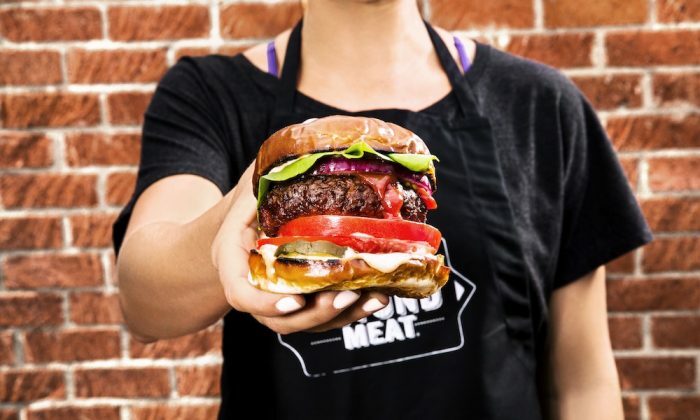 The concept of selling Beyond’s plant meat alongside flesh meat debuted in Boulder, Colorado, in late May and the products sold out in one hour, according to a post on the company’s Twitter account. “A lawyer by education, he had the guts to take on the meat industry—and McDonald’s for that matter—by calling his products ‘plant meat,'” said Hoogenkamp. Now that the millennials have become a more important segment, the legacy can’t any longer stick their head in the sand and pretend nothing has changed. Brown is clearly hopeful of a shift along these lines and is betting on the consumer to choose. However, he says his Beyond Burger has “many miles” to go before closing in “on that perfect, indistinguishable build.” His burger already bleeds, thanks to pulverized beets, but doesn’t yet behave and taste exactly like meat. “When we arrive there, I believe we can begin to retire the meat/no meat debate,” he writes.